This looks like wanna-be Oscar-bait that will be immediately forgotten after day one of release. Fox Searchlight would have a better shot at making money if they made a live-action Winnie the Pooh film in the vein of John Wick. My phone-line is available for more ideas. Official Synopsis: GOODBYE CHRISTOPHER ROBIN gives a rare glimpse into the relationship between beloved children’s author A. A. Milne (Domhnall Gleeson) and his son Christopher Robin (Will Tilston), whose toys inspired the magical world of Winnie the Pooh. 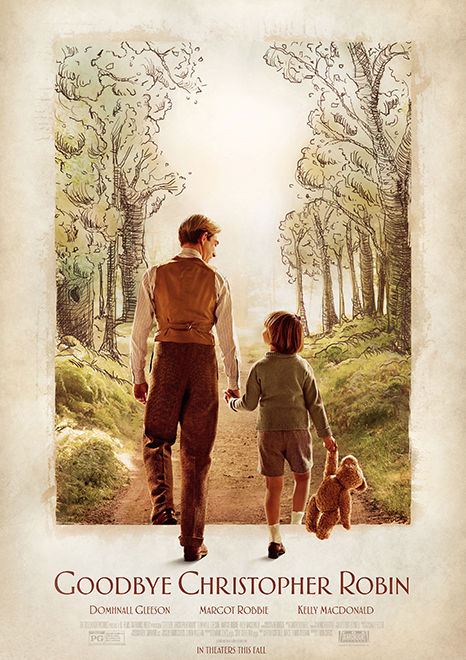 Along with his mother Daphne (Margot Robbie), and his nanny Olive (Kelly Macdonald), Christopher Robin and his family are swept up in the international success of the books; the enchanting tales bringing hope and comfort to England after the First World War. But with the eyes of the world on Christopher Robin, what will the cost be to the family? The movie comes out right in time for Halloween – October 13th. I’ll be elsewhere. Here is the New Trailer for ‘Suicide Squad’! This entry was posted on Friday, August 4th, 2017 at 2:27 pm	and is filed under Film, News. You can follow any responses to this entry through the RSS 2.0 feed. You can skip to the end and leave a response. Pinging is currently not allowed. « The Karate Kid will Sweep the Leg one last time! Did you see that? Those are *your* weapons... in the hands of those murderers! Is this what you want? Is this what you wish the legacy of the great Tony Stark to be? I build them a missile they'll kill me. If I don't they'll kill me. Either way, I'll be dead in a week. Then this should be a very busy week for you, won't it?